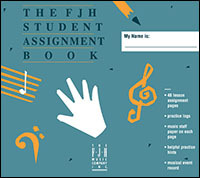 A wonderful organizational tool, this assignment book includes practice tips, a record of important musical events, and weekly practice logs (including staves for teacher use). This useful resource for students, parents, and teachers, helps organize lessons week by week and motivates students by keeping a record of their progress and achievements. The book includes: "A Guide to Successful Practice for Parents and Students", 48 Lesson Assignment pages that include a practice log, assignment writing space for teachers, space for student self-evaluation, 4 full pages of manuscript paper, and a "Performance Record" for the year. This assignment book has everything needed to keep students organized and on track all year long! 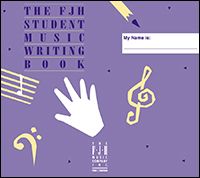 Twenty-four pages of widely spaced staves, just right for the younger student's early experience writing music. 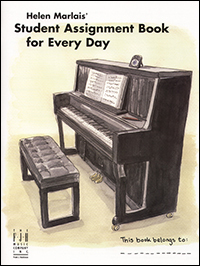 The book includes a thumbnail guide to music notation, with an actual example of music and identification of the musical elements.